Pre-Biotics are the fuel that feed your skin’s microbiome, allowing skin-friendly bacteria to flourish. Your skin’s barrier function depends on a delicate balance of “good” and “bad” bacteria. Good bacteria keep your skin looking healthy and fresh. This range takes inspiration from the best that nature’s Superfoods have to offer. Nutrient-dense Supergreen, Supergrain, and Superfruit Complexes give your skin the daily dose of essential vitamins and minerals that it craves. ELEMIS was born out of the vision to bring together the power of nature, science and aromatics. We believe in the truly transformative power of natural active ingredients, expertly formulated, to ensure maximum efficacy and safety. Our scientific chemists constantly strive to ensure that new formulations adhere to our ELEMIS Promise “To be free from Artificial Colors, Parabens, SLS, SLES, DEA and Mineral Oils”. Combining the pure power of concentrated Superfoods with the science and expertise behind every ELEMIS formula, the Superfood Skincare Range packs a powerful punch. Taking inspiration from the best that nature’s Superfoods have to offer, nutrient-dense Supergrains, Supergreens and Superfruits are cleverly combined with an active Pre-Biotic. Rich in anti-oxidants, omega fatty acids, vitamins and minerals, Superfoods feed the skin with nourishment for pure skin vitality while Pre-Biotics protect and maintain the skin’s delicate microbiome. 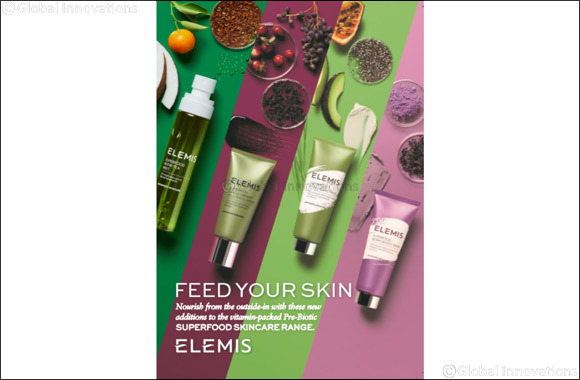 ELEMIS Superfood range delivers a finely balanced skincare plan to awaken a healthy, vibrant and outdoor fresh skin vitality. A 4-in-1 treatment mist infused with vegan Kefir Ferment to balance skin and Organic Roobois Tea Extract to brighten. Tone, prime, set makeup and get an on-the-go splash of hydration. This super gentle facial scrub, jam-packed with anti-oxidant rich, sustainably-sourced Blackcurrant Fruit Pulp and radiance-boosting Black Tea Extract, leaves the complexion smoother, softer and hydrated. A purifying mask with Brazilian Purple Clay and an omega-rich Superberry Complex to balance the T-Zone and help mattify skin. Get a shot of green goodness with this treatment mask that nourishes the skin with Avocado and Kale Extract. Chia Seed Oil locks in hydration, whilst radiance-boosting Passionfruit Acids brighten the complexion.